One year ago, in a landmark election, Maithripala Sirisena was elected as the Executive President of Sri Lanka. It was a historical event because it was the first instance where an incumbent President lost a presidential election. It was a momentous occasion also because President Sirisena’s victory was achieved against all odds which were stacked firmly in favour of his predecessor, Mahinda Rajapaksa. President Sirisena rode to power on the slogan of good governance (or ‘yahapaalanaya’). One year on, we review the President’s stewardship on the key issues related to his tenure of office. 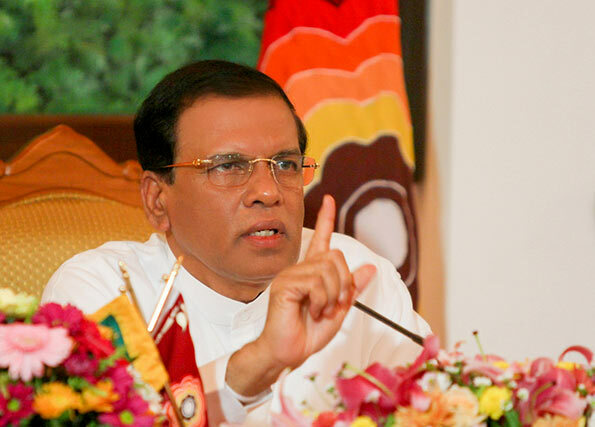 President Sirisena did make a sincere effort to abolish the Presidency during the interim government between January and August last year but was stymied by the faction still loyal to Mahinda Rajapaksa. The result was a diluted 19th Amendment emerging in Parliament that enables the creation of independent commissions and the Constitutional Council but still left most of the executive presidential powers intact. The President has desisted from using them most of the time and has promised to renew his efforts to abolish the Presidency in the new Parliament. How this will eventuate remains to be seen. If the President has failed in his attempt thus far, it has not been for the lack of commitment. Again, the President did wish to change the system of elections into a hybrid between the first-past-the-post and proportional representation system in time for the August general election. However, logistical difficulties in demarcating new electoral divisions as well as a lack of enthusiasm from the United National Party (UNP) prevented this from becoming a reality. Perhaps it is just as well because a hastily drawn up electoral map could have had repercussions for decades to come. With the current Parliament, the President now has a second chance to enact these reforms, in tandem with abolishing the executive powers of the Presidency. A key issue in the election campaign, there has been widespread relief in legal, judicial and law enforcement agencies that the stranglehold the previous regime maintained has been relaxed. These agencies now mostly operate freely and without fear although the odd incident when a minister has tried to influence officials remains. The restoration of the privileges of Sarath Fonseka and Shirani Bandaranayake were steps in the right direction. The President’s score in this domain would have been higher if not for the recent shenanigans of Minister Wijeyadasa Rajapaksa and parliamentarian Hirunika Premachandra whose actions- and the lack of consequences- suggest that there is still more work to be done in erasing the culture of political impunity. The driving force underpinning the President’s election, there has been general disappointment regarding this aspect. The public is mostly disillusioned by two acts: the appointment of defeated candidates to Parliament through the National List and the continuing expansion of the Cabinet to woo Rajapaksa loyalists to the President’s side. These fly in the face of the concept of good governance although they form part and parcel of the President’s strategy necessary for his political survival. This is arguably the most significant factor that has affected the President’s image and popularity negatively. During the President’s election campaign, much was made of the bribery, corruption and abuse of power allegations against key figures of the previous regime. Since then, there has been a steady parade of individuals being summoned before various investigative bodies but little has happened by way of convictions or even indictments against the alleged offenders. Admittedly there are procedural delays and a lack of resources to deal with the vast number of complaints. Nevertheless, the electorate is disillusioned about the lack of progress in pursuing these allegations. This is probably the brightest feather in the President’s cap. Sri Lanka was on the brink of being declared a pariah state during the last years of the previous regime and almost every nation and the United Nations was at loggerheads with Colombo, with the exception of China. Sanity has prevailed since then. Not only has the government successfully negotiated with the United Nations Human Rights Council, it has also restored good relations with key allies such as India, Pakistan, the United States, the United Kingdom and even China. It has done so without creating a domestic backlash. Certainly there is more to be done, especially with the deadlines from the UNHRC looming but Foreign Affairs seem to be back on the right track. Strangely, this has been on the backburner for some time in a country which was preoccupied with the excesses of the Rajapaksa regime. It is likely to come to the fore once again through the UNHRC but signs of mending fences are apparent. There is mutual respect between the government and the Leader of the Opposition R. Sampanthan and expectations are high that proposed constitutional reforms will incorporate a reasonable solution to ethnic grievances. The demilitarisation of the North has begun and the release of detainees has contributed to the détente. The government is also engaging the Tamil Diaspora, another positive feature which would have been unthinkable a year ago. It would not be fair to blame the President for economic woes such as the spiralling cost of living when the key players managing the economy are UNP ministers. Nevertheless, the fiasco surrounding the recent Budget left much to be desired and raises the question as to whether the President should have adopted a more ‘hands on’ approach on key issues affecting the country. While this could be construed as interference by the Executive, what transpired in the 2015 Budget should not be repeated. The President promised a simple lifestyle in comparison to the grandiose excesses of his predecessor. This promise has been honoured with perhaps the one transgression being when his son accompanied him on the official delegation to the United Nations. Large delegations do not accompany him on specially chartered flights when he visits overseas. These are minor changes but have contributed to the President retaining his image of a simple politician not given to the trappings and temptations of high office. Despite still having most presidential powers at his command, the President has struggled to exert firm control over his own party where dissidents loyal to Mahinda Rajapaksa continue to divide the SLFP. This has been a hindrance not only to the President but also to the country which has to pay by way of an expanded Cabinet and accommodating losing candidates in Parliament. Even these strategies don’t seem to have worked as the dissidents plan setting up a separate political alliance for the upcoming Local Government elections. The President’s biggest headache remains not running the country but taking firm control of his political party, a goal which has eluded him so far due to Mahinda Rajapaksa’s relentless political machinations. The danger is that continued instability in the SLFP can only weaken the President and by extension, handicap his performance as the Head of State. With four years left of his five year term of office, most Sri Lankans would probably agree that the country is now on a better footing than it was a year ago. President Maithripala Sirisena may have made his share of mistakes in his first year in office but it took a man of courage to challenge the might of the previous regime and he did so without flinching at the possible consequences. The country must salute him for that and wish him well, for he has miles to go and many more promises to keep. Mahinda again slowly poisoning the SLPF .get the hell out of these politics, and let them do as GG. Mahinda poduru eu kannethne , kana gonata dhenneth ne. The history if at all ought to relate to post independence. Mr Sirirsena has been in active politics for 30 years or more so his achievements ought to date back at least 20 years back with his association with the freedom party. During this period he served as an mp then a minister and then finally defect from the Rajapaksa government. As a common candidate he would have enough insight to the workings of Rajapasa administration that would have helped him to undermine Mahinda backed up by the renegades factions of the SLFP. After one year he remains president and will remain so until there is some form of constitutional reform for he cannot abdicate then the `presidential office’ will be run by the judiciary until fresh elections can be called. Bringing about a constitutional reform is complex for the Ranil coalition cannot hold together to maintain the two third majority to prosecute even the idea. The economic mess is getting deeper and the dollar is selling at 144 odd rupees consequently cost of living is spiraling imagine what it would be like to if the dollar sells at 200 rs. Our improved foreign relations has not helped us to fortify the balance of payments and no foreign policy to speak of. Hypocrisy and cynicism are the trademarks of or our people and the system so any constitutional reform nor the electoral system is going to have any influence on the development process. The plantation system is in chaos because of incompetence. As is the system has fallen apart and is beyond redemption and the only means it can be salvaged is through collectivisation and managed by people who work the system. Pay hike to the tune of 20,000 rupees pay hike nor the lifestyle they lead does not demonstrate what Mr Sirisena’s claim to simple life style.